"...So that's Quidditch." Hugo had just finished explaining Quidditch as the train stopped. All six of them got up and walked with the group of people heading towards the castle. "Firs' years! Firs' years please!" Lily heard a familiar voice cry. She grabbed Hugo and Archie, not wanting to get separated from them, and dragged them towards the great big figure that stood not that far from her. "Hullo Lily. Hugo. Hows yer parents?" He asked as they stopped in front of him. "Hey Hagrid. Why didn't you come over this year! I was looking forward to my birthday cake!" Lily said. "Yeh, sorry 'bout that. I couldn't get over this year." "It's OK Hagrid." Hugo said. "But now we can see you everyday!" "That's true. Right, OK. Firs' years! Follow me!" They all started to follow the big figure along a path. At the end was the lake with boats all waiting to be used by the new Hogwarts students. "Four to a boat." Hagrid called to the group of kids. "Come on everyone! Get in!" They all did as they were told. Lily, Hugo and Archie all got in one with another girl. She had blond hair down to her waist and looked like a quiet girl. She didn't say anything as she jumped in the boat with them. The boats suddenly started to move along the still water. There was excited whispers between everyone in boats. Hogwarts came into view. It was amazing. Towers were stuck on everywhere, all built of stone. Lights shown onto the magical building for all directions. Lily thought it must have looked better before it got destroyed 20 years ago. She never knew why but her dad said he wasn't there to see anything, everyone from the school had to leave. "This is going to be amazing!" Hugo whispered to her. She nodded, no words coming out of her mouth. She looked round at Archie, who was the exact same. He was going to be so shocked at this new type of world. Like her dad, after learning about the wizarding world he abandoned the Muggle world. The boats hit the shore and everyone climbed out. Lily noticed the blond girl from their boat went to the back, not with anyone. Lily felt sorry for her. "Right, stay here. Someone will come to collect you in a minute so no funny business!" Hagrid told the crowd of kids. He walked down the path again until he was out of sight. Everyone stood, whispering to each other as they waited. Suddenly the big, oak doors opened and a man with jet, black hair stood in front of them. He was smiling at them all with a huge grin on his round face. "Good evening everyone." He said to the group. "My name is Professor Terrian. I am the transfiguration teacher and deputy head of Hogwarts. Please follow me into the Entrance hall." He walked into the castle, his long, brown coat floating behind him. It was amazing. It was surprisingly warm since the place was made of stone. Everyone were staring at the roof and the walls and the staircases. Professor Terrian was smiling. "Alright everyone. 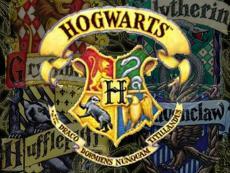 As you know you get sorted into one of the Hogwarts houses. Hufflepuff, Ravenclaw, Gryffindor and Slytherin. In a minute I'll take you all into the Great Hall to be sorted. Please wait here, quietly." He walked back down a corridor, leaving all the first years on their own. All they could do was keep talking together in excited whispers. "I can't believe it! Everything is real but seems too...fictional!" Archie whispered to Lily. She grinned at him. "Well to me this is life. I grew up in the wizarding world. It's completely different." People started to look around the group of kids. There was a boy with a smug look on his face. A girl with mousy blond hair and glasses looking as confused but excited as Archie and a girl with purple hair. She was showing a group of kids a card trick. "Muggle magic." Whispered Archie to Lily and Hugo. "Not as impressive as real magic." At that moment Professor Terrian came back. "OK children. Follow me!" He turned and lead them through another set of bid oak doors. The room beyond was amazing. Four long tables down the middle had all the other students in Hogwarts and right at the top of the room was the staff table. The ceiling held most peoples attention. Every first years eyes were gazing up at the enchanted roof, which showed what it was like outside. At that moment stars were peeking through the small patches of clouds. Candles floated just below the ceiling, which defiantly impressed the Muggle-borns. Juts in front of the staff table there was a stool with a very battered hat on top. It looked black, as if burnt and had huge rips on it. The crowd all moved into the area in front of all four tables. Professor grabbed a roll of parchment and stood by the stool. "Please, when your name is called step up and put this hat on your head. Please be very careful as this is a very important hat and has been through alot. The girl with the purple hair hopped up the stairs. Spinning round she sat down. Professor Terrian Put the hat on top of her head. It was a while before anything happened. "GRYFFINDOR!" Shouted the hat. Lily and Hugo were expecting it but Archie jumped backwards. "The hat talks!" He whispered to the pair, all the Gryffindors cheered and clapped as Grace hopped over to the table. "Well duh!" Hugo said. "How else would it tell us what house you're in." "Bellowin, Christopher." Terrian called. This time it didn't take too long. A few seconds in took the hat to decide. "RAVENCLAW!" A table started to cheer loudly as the boy ran towards them. "Bullen, Alice." Terrian called. The girl from Lily's boat ran up, her long blond hair gliding behind her. This time the hat was hardly on her head when it shouted "GRYFFINDOR!" It was a while before the list got to P. The smug boy called Sire Gilmore was put into Slytherin and the mousy haired girl, Pandora Innis, also in Gryffindor. A load of kids Went to Hufflepuff and Ravenclaw. Finally it got to "McKenzie, Archie." and very nervously Archie walked up to the stool. Professor Terrian Put the hat on his head and he closed his eyes. The hat seemed to be puzzled. Lily and Hugo waited patiently as the hat tried to decide. "GRYFFINDOR!" If cried and the table with the Gryffindors roared with more cheers. Archie jumped down and ran to the table with a huge smile on his face. "Potter, Lily." Terrian called. Lily ran up and slipped the hat on. "Hmmm, another Potter. All of you great in the wizarding world. Famous, every single one of you." The hat said in her ear. "Gryffindor father, mother and brother. Yet the other brother a Slytherin. Why is he in Slytherin? Why should you be in Gryffindor?" "I don't care!" Lily said back. "Put me in any!" "Well, let's go with the blood shall we? GRYFFINDOR!" Lily walked towards the cheering table and looked over at the Slytherins. She saw Albus looking glum. Did he want her to go in Slytherin? Hugo was out into Gryffindor, everyone knew that would happen. All Weasleys Are In Gryffindor. It's a well know fact. As Hugo sat down the Headmaster stood up. Professor McGonagall. A truly wonderful witch, said her father. "Welcome! Welcome back to another year at Hogwarts School of Witch-craft and Wizardry. It is such an honor to have you all come here today. I would like to remind everyone that, like every year, The Forest is out of bounds, hence the name. Now we have a new Potions this year.Professor Hitchens. Well that's about everything. Let the feast begin!" She clapped her hands and food appeared on the plates. Everyone either stared in amazement or dug in. "Come on Lily!" Hugo said. "Hurry before all the good stuffs gone!" "In all my life I have never been offered so much food." Sh said. She grabbed a chicken wing and started to eat it. "This place is amazing!" Archie said to them both. Grace, the purple haired girl suddenly sat down next to Lily. "You don't mind if I sit here do you?" Grace asked Lily. "Just the boys over there, they are idiots." She turned her head and glared in the direction she came from. "No, it's fine." Lily said. "I'm Lily Potter. My cousin Hugo Weasley and my Muggle friend Archie McKenzie." "Nice to meet you. I'm Grace Anderson. Well looks like we'll be sharing a dorm doesn't it!" She said excitedly, biting into some beef. "We're also sharing with Pandora Innis, Alice Bullen and Jessie Finnigan." Hugo just stared at her. "Do you have any older brothers or sisters?" Lily asked. "Nah. Oldest in the family. Come from a wizard family. It's not a very old family though. What about you?" "Well I'm the youngest and I'm not sure how big my family is. Dad never let's us look at his family's history." "What is that meant to mean?" Lily asked. Anger rose up inside her and she knew Hugo felt the same way. "Oh it's nothing. Just it must have been hard for your dad." Grace said, taking another bite of meant and veg. "Well maybe you should mind your own business." Lily said. She grabbed her plate. "Come on Hugo, Archie. Let's find James and Rose." "Ooh! James! He's like super hot isn't he?" Grace asked her. Lily got up in disgust and found her brother next to Rose. "Ohmigod!" Lily said, plonking herself across from them. Hugo sat on her right side, Archie on her left. "What's up?" Rose asked them. "We've been here for like an hour or something and I'm already making getting on the bad side of people. Or they're getting on the bad side of me." "Don't worry." Said James. "You'll become friends. You just wait." She nodded. Maybe it will get better. Maybe it won't. "It can't be that bad." Archie commented. "I mean, this is magic! Magic can't be that bad." No it couldn't be, Lily thought. She looked round to try and see Albus but got distracted. On the Ravenclaw table sat five kids. All between first year and forth year and all seemed to be staring right at her. Ahhh!!! This was such a great chapter yet again!! !